Starting any new sport, much less a martial art, can be difficult. Our fundamentals program allows you to learn the basics in a very controlled, safe, and fun environment. 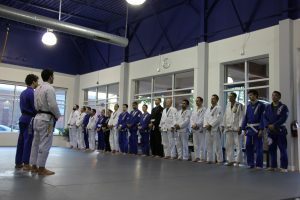 The structured curriculum is designed to effectively introduce all the basic positions, techniques, submissions, and escapes. The classes will prepare you for both self-defense and sport jiu jitsu. It will also improve your fitness, balance, and coordination. The fundamental program is designed for anyone, male or female, of any body type, fitness level, or age (14 or older). This class lays the foundation of knowledge upon which everything else will build. One of the biggest shortcomings of many jiu jitsu academies is a lack of such a comprehensive system. Our system was designed by the founders of the Alliance team and is unique. As evidenced in our results as the most dominant team in the history of the sport, the system works, and the fundamentals foundation allows you to reach your maximum potential in the sport.